Its trunk show time again for all of you that are waiting to buy your glasses, now is the time!! These special discounts that you will be getting are limited to only once a season. Why wouldn’t you want to roll into 2018 with a new frame style. If you haven’t bought glasses for 2 years now is the time to upgrade. What’s your favorite style? Everyone is so different in what they like. Some people like the cat eye look, the round frame look, rimless, titanium, glitzy and glittery or maybe your favorite style is more classic. Whatever style suits you, you are sure to find your perfect match at our trunk show. 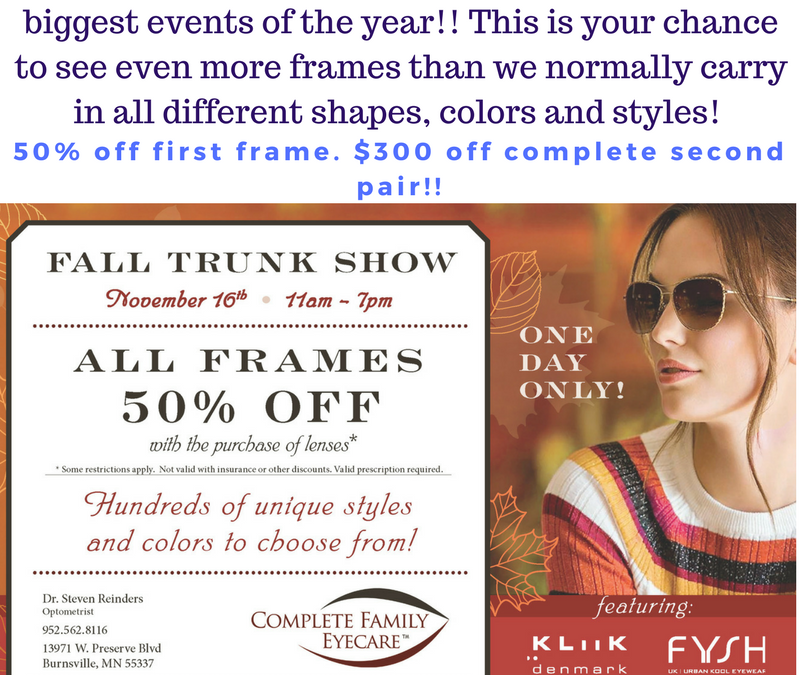 Please join us on November 16th from 11am-7pm to see an even larger selection than normal of our eyeglass frames. This is a great opportunity to try on many different styles and colors that you normally would not have access to cause our rep from Westgroupe will be bringing in a much wider selection of different frame styles. We are talking about 100’s of more frames to choose from. This season we are featuring Kliik, Fyshuk and Evatik! All frames are 50% off and we are offering $300 off a complete second pair! We can’t wait to see you there! Food and beverages will be provided. Our rep from Chu Vision will be there to talk about lasik and custom cataract surgery. Once again, our special trunk show event only happens twice a year and these deals are not to be missed! We cannot wait to see you there!